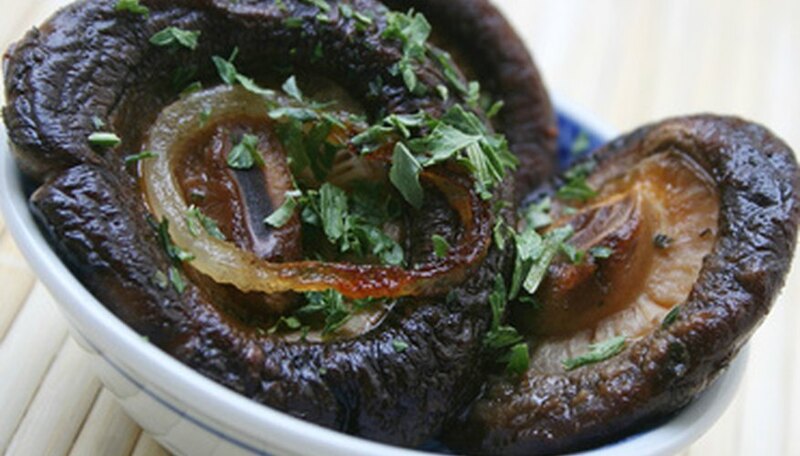 Shiitake mushrooms are an important part of gourmet cooking. They have been grown commercially in the U.S. for more than 20 years. It is common for vegetarians to use the delicacy as a replacement for meat because of its full, meaty texture. There are two ways to grow shiitakes--on logs and on sawdust blocks. The blocks are the newer of the two concepts. They are prepared with a combination of hardwood sawdust, wood shavings and oat bran and are inoculated with shiitake spores. The fungus quickly absorbs into the block, using the nutrients to sprout mushrooms quickly. Get sawdust blocks that have been inoculated with shiitake mushroom spores. The spores will enable mushrooms to fruit. The blocks are available at mushroom supply stores and online. Put the sawdust blocks in a sterile plastic bag. Fasten it loose enough for the air to go in and out. Store the bag in a humid environment to encourage the spores to grow. Plastic storage containers or old fish tanks are perfect places to store the mushroom block. The location needs to have a stable temperature and humidity. You will notice a white coat developing on the block. This protects the young shiitake mushrooms. Mist the shiitake mushroom block daily with a water sprayer. Use bottled or distilled water. Make a slit in the bag with a knife when you notice small shiitake mushrooms starting to sprout. The mushrooms need fresh air to grow. If yours are being kept in a container or fish aquarium, fan the inside frequently. Take the sawdust block out of the plastic bag once it becomes completely white. Keep the block in a spot where it can grow. The temperature should be between 50 and 70 degrees F. Small bumps will form and mature. Wait for all of the coating to become brown, which can take up to three months. Submerse the shiitake mushroom block in a bucket of cold water. This stimulates the fruiting process. Move the bucket to a location that receives sunlight, such as a windowsill. Keep the mushroom block in the water and sunlight for two days. Take the sawdust block out of the cold water bucket after the two-day period. Put it back in the original growing location and wait one to two weeks for the mushrooms to fully fruit (mature). Once they fruit, remove them from the block. Cut the mature mushrooms off at the tip. Expect up to seven flushes (crops) of shiitake mushrooms from each sawdust grow block. That is equivalent to 2 pounds of shiitakes. Mushroom logs usually grow only two to four crops, but blocks offer more. Simply follow the above steps again. Wear gloves if you want to keep your hands clean and protect them when handling spores.